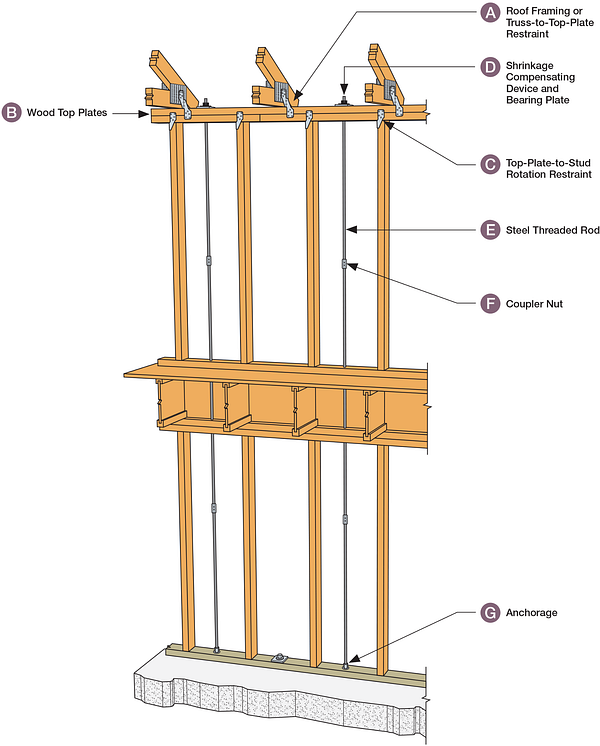 Rod tiedown systems have been used by the light-framed wood construction industry to resist wind uplift forces. Yet codes and standards have not provided detailed guidance for design of these systems. Designers, consequently, have been forced to rely entirely on engineering judgment and/or trust a rod manufacturer's literature or substitution submittals to create this load path. This lack of guidance sometimes led to rod-restraint spacing based on rod tension and bearing plate capacities alone. This design neglects the wood components of the system and may lead to rods spaced too far apart, compromising the continuous load path, causing building damage and creating life-safety issues. The steel components making up continuous rod tiedown runs (CRTR) only. If a manufacturer has a CRTR report, the Designer of Record must take the time to evaluate how the light-framed wood members will transfer forces to the CRTR. The entire continuous rod tiedown system (CRTS), which includes CRTR and the light-framed wood structure used to resist wind uplift. If a manufacturer has a CRTS report, this saves the Designer of Record time. 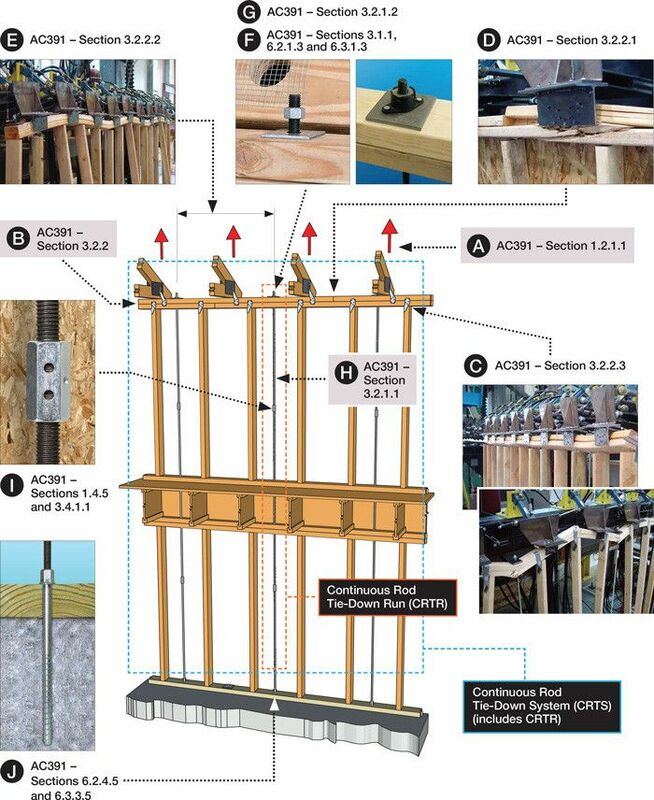 These same guidelines in AC391 can be used by project designers themselves to lay out continuous rod tie-down systems to resist wind uplift. 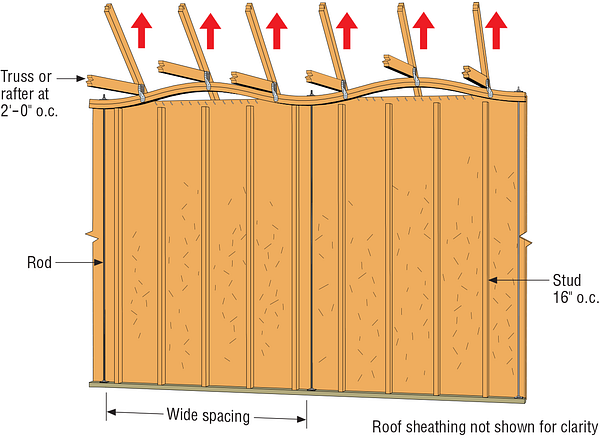 Use of continuous rod tiedown runs (CRTR) and continuous rod tiedown systems (CRTS) is limited to resisting roof wind uplift in light-frame wood construction. Specifically excluded from AC391 is the use of CRTR to resist shearwall overturning forces or use in cold-formed steel framing. Proof of the positive connection between threaded rod and threaded rod couplers shall be provided, such as Witness Holes™ or other method. Rod couplers must also be tested to prove they can develop at least 100% of the rod's tensile strength and 125% of the rod's yield strength.